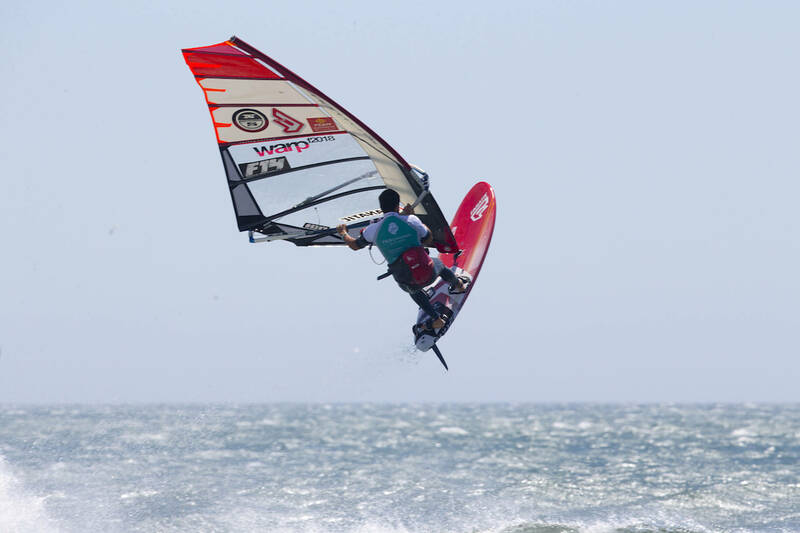 Before 2014 Pierre Mortefon (Fanatic / Duotone / Chopper Fins) had never finished in the overall top 10 of the PWA Slalom World Tour, however, he had been knocking on the door, finishing 12th overall in 2013. Since then Mortefon has never looked back, quickly developing into one of the most dangerous and consistent sailors on the racing circuit. Together with Antoine Albeau (RRD / NeilPryde) and Matteo Iachino (Starboard / Severne / Shamal Sunglasses) they make up the formidable ‘Big Top 3’ with Mortefon himself not finishing outside the overall top 3 since 2014 and finishing as the vice-world champion on a couple of occasions. Hey Pierre, Happy New Year, how are you? Hi Chris, everything is ok I started the year really well at home with great conditions, some cold temperatures but great wind. You produced another extremely consistent performance last season - winning the final event of the year in Sylt, and only missing out on the podium once… how happy were you with your sailing over the last year? I am super happy about my 2018 season, like you said I was pretty consistent with a lot of podiums and finally this victory in Sylt. Finally I would say that I was in the running for it all the year. It was not easy as I experienced an incredible moment 15 days before the season with the birth of my son Léon. So with all those emotions, I am super happy about my result. Everyone remembers that crash between you and Taty in July 2017 - do you think that affected your racing approach at all this season? And did that make returning to winning ways in Sylt sweeter? For sure it affects but it was more end of 2017 season, maybe the beginning of 2018 . For sure I still have it on my memory when I start the first final this year in Fuerte but now it’s definitely over. Sylt is making no changes about this remember, it just permits me to end the season the best ways possible. Over the last 5 seasons you haven’t finished outside the overall top 3… what do you think the key to your success and unbelievable consistency is? This is really nice and I am proud of it, especially with all those changes. The key is maybe to maintain a certain level of training and organisation of the way I am preparing and living the season. But I also really like what I am doing for my living and I really enjoy being on the line and fighting for it! Aside from obviously tweaking, tuning and spending hours on the water testing - do you also train off the water and what would a typical workout for you to consist of? Do you have a personal trainer? For sure I also spend lot of time out of the water preparing myself. I try to be really professional on this aspect, firstly to avoid injury and to be fit from the 1st to the last day of the event/season. Yes I have a personal trainer at home who is also a windsurfer, so he understands easily, and exactly, what I need to focus on and also my form before and during the season. Do you have a strict diet that you follow? If so, what? Nothing really special, I try to have a complete diet, eating everything to be able to stay in shape, keep my weight and the power on the water. As a Frenchman I really like the gastronomy and I am often happy to share a good glass of wine. Foil is obviously gaining popularity at the moment… as one of the top Slalom sailors how do you feel about Foiling? For sure now we have to deal with it and it’s not as easy as before when we only had one discipline to focus on and now I will have to focus on 2. Foiling is good for the sport because it helps to windsurf in new conditions and it can help to attract new people on the water. But I am also really afraid by the way it’s sometimes going. Few people simply want to replace slalom with foil, I think it’s definitely not smart because slalom/freeride is the base of windsurfing ! At the beginning, it should have been an addition to the sport, helping to have more events, better numbers and even more sponsors but at the moment I am not sure the benefit is huge for the fleet. I hope I am wrong and foil will find its place on tour without having any influence on slalom. At some events last season you guys were asked to compete in both Foil and Slalom on the same day… and there was definitely some feedback from some sailors that it’s very difficult to switch between the two disciplines as the techniques vary so much, do you agree with that? Yes, I think it’s not easy because it’s clearly 2 different disciplines. For me, you can compare it to Freestyle and Wave. We had some really hard days on the water like in Sylt or in Costa Brava switching from one discipline to the other in a really short space of time. You need to change your mind, your skills, your equipment without forgetting that maybe you will be changing back soon to the other discipline. It’s also really tricky just getting to the event now that we have to carry lot of gear. We will see in 2019 if the overall will be important or if we will have specialists in both discipline. How will you be spending the rest of the off season? After Sylt I had 10 days at home where I was simply enjoying life and doing nothing in relation to windsurfing. Then I flew for 3 weeks in Maui to work with Marco Lang and Kai Hopf on the 2020 sail. It was really nice, we sailed everyday, I learned a lot and we find some really good sails. I also had the time to enjoy some waves and hit some rocks ;) After that I was home, I start my physical preparation early to be able to enjoy Christmas to the max then 2019 was ON already! Now I am in Tenerife, I will make a break in February then I will come back here on the TWS Centre to train with the guys. Then in March if the conditions are great I will try to enjoy sailing in the south of France to prepare for possibly the 1st World Cup of the year there! And finally, what are you goals for 2019? Finally getting my hands on the biggest trophy!!! Thanks, Pierre. Good luck with the training in Tenerife and see you on the tour soon!